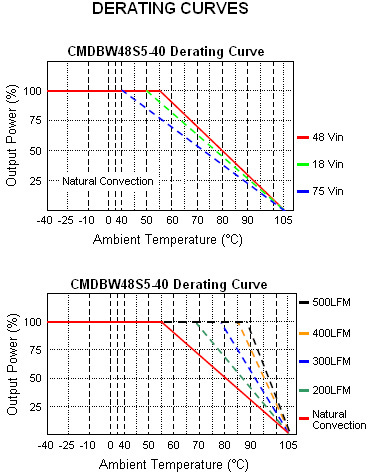 The CMDBW series of high efficiency chassis mount DC/DC converters are single output modules with up to 40 watts of output power. 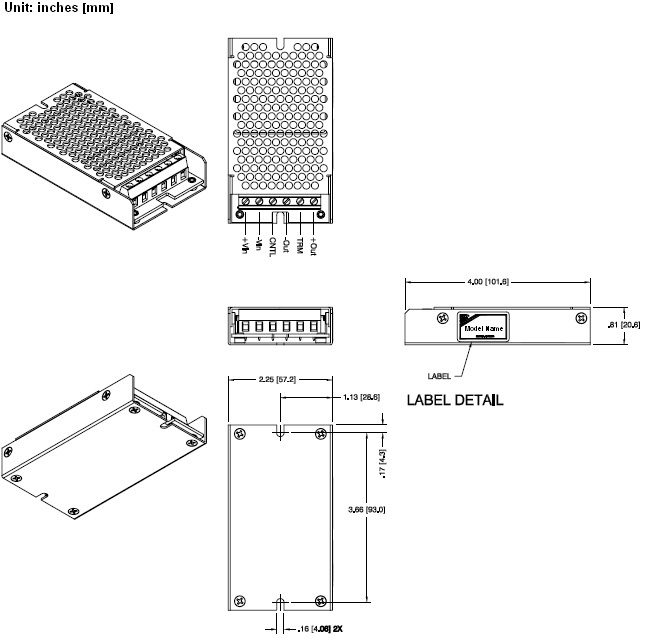 This product is ideal for telecom and networking applications, and is designed for a 4:1 input range of 9VDC-36VDC or 18VDC-75VDC. Some features include 1600VDC isolation, remote on/off, and output adjustability. All models are short circuit, over load, and over voltage protected. Chassis mounts come in open frame, U channel, and enclosed types. MTBF: BELLCORE TR-NWT-000332. Case I: 50% Stress, Temperature at 40°C. (Ground fixed and controlled environment). MIL-STD-217F Notice2 @ Ta=25°C, Full Load (Ground, Benign, controlled environment). Heat sink is optional. Please call factory for ordering details. Output ripple & noise measured with a 0.1µF/50V MLCC. Chassis Mount Options: No suffix for open frame, "U" suffix for U Channel (add $10.00 to the listed price), and "E" suffix for Enclosed type (add $17.00 to the listed price).